Jyotindra International is one of the largest exporter manufacturer and supplier of Senna Leaves Powder and Senna Pods Powder and its base products. It has total Senna Pods and Leaves production capacity around 2000 Tons per annum. There is policy of the company to upgrade the equipments to get the best quality product thus today company stand at the first rank in 100 % customer satisfaction on quality, on time delivery and prompt in communication. Jyotindra International has its own supply chain in Jodhpur, Sojat , Falodi and Bikaner to supply uninterested Senna Pods and Leaves supply. We are also dealing in contract farming and organic farming as per European Standard. 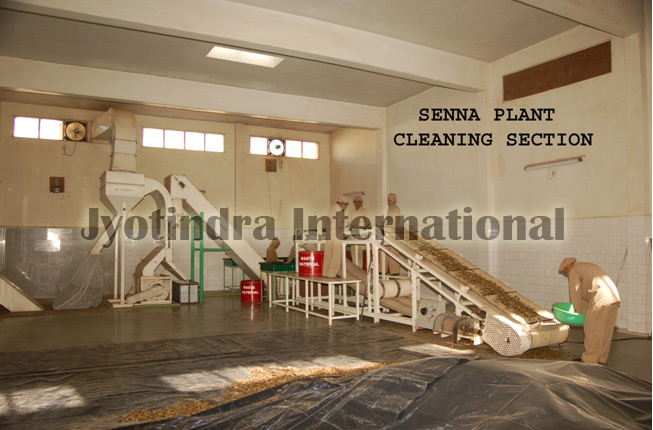 Senna is manually cut from the plant and primary clean at our Jodhpur facility where we remove all the sand, seeds, foreign matter and separate the leaves according to their grade. We have fully covered RCC flooring latest equipment in the Jodhpur Faclity. We have one of its kind facility for artificial drying of Senna Pods at our Palanpur facility to reduce the moisture thus increasing self life of the product. Material is clean at final stage of cleaning through manual and machine cleaning before bailing into final packaging. Finish material Senna Pods / Leaves is fumigated in vaccum chamber for effective fumigation and this will help to reduce the residue problem upto certain extent.